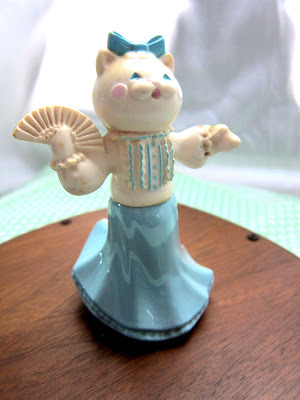 There's nothing like visiting a garage sale, flea market, or thrift shop and coming across your dream cat figurine. 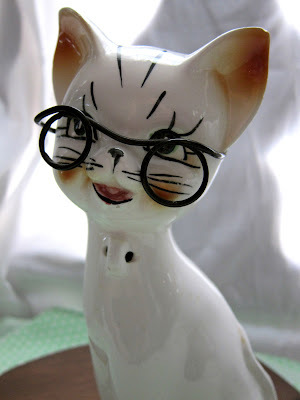 However, for Amanda of Retro Meow, a shop consisting of vintage cat and kitten collectibles, she doesn't have to look far because she already has more than she knows what to do with! 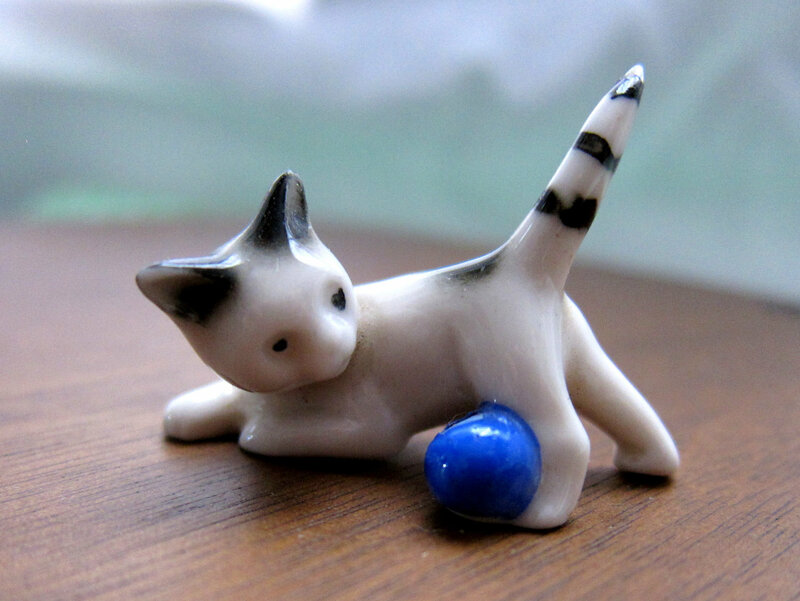 It all began when she was a child and used to count the number of cat figurines at her grandparents' house. She says, "There were cats in curios, cats on shelves, cat themed blankets and pillows, stuffed cats (not dead ones thankfully! ), and dishes with cats on them. There was even a cat-shaped tape dispenser!" After Amanda's grandmother passed away, the extensive collection was passed down to her ("I guess she remembered all the hours I spent as a child counting the cats"), and she began looking for ways to disperse them. She gave them away to relatives, sold some on eBay, and almost resorted to a "drive-by catting" (leaving boxes of cats on people's doorsteps), before finally deciding to adopt them all out to permanent homes through the online shop she calls Retro Meow. "So, I originally started with about 8 or 9 big rubbermaid totes full. The last time I counted all the cats (as a young child) there were over 1,000. And my grandmother usually added a few more each year, so there were probably at least 1,200 when I started. After my grandmother passed away, I culled the collection pretty quickly. I tried selling some at a yard sale, but that was a bust. I switched to eBay and ended up selling a handful. Then I donated a lot of the ones that had chips or obvious repairs. I also donated those that were clearly from the dollar stores and those that probably wouldn't have much resale value. Of course, I kept a few favorites for my home, too! I have about 3 large totes left to sell. My guess is that there are probably about 300-400 cats left, but it's hard to say. A number of them are under 2" so you can imagine how many there might be! There are also some really large ones, including cookie jars, so there may be a lot less. I just don't know! I guess I'll find out as they get unwrapped, photographed and listed. I plan to keep listing cats until they are all posted. I just found out the Teal Cat Project this week, so I think I'll probably donate the ones that don't sell (and meet their criteria) to their fundraising efforts. I think what they're doing is pretty rad, and I think my grandmother would have supported it, too." I'm sure Amanda's grandma would approve of her efforts, and it's really fun looking through her shop and finding such a diverse array of choices. 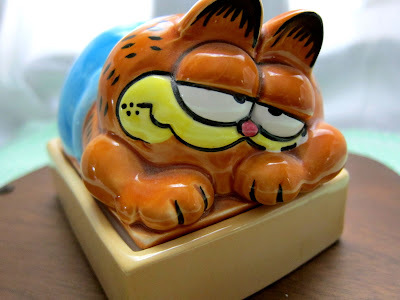 Since I came across Retro Meow last week, I notice she's been continuously adding new stock, so I recommend not only checking in once, but going back again if you're looking to find the purrfect, well-loved kitty figurine for you! OMC! 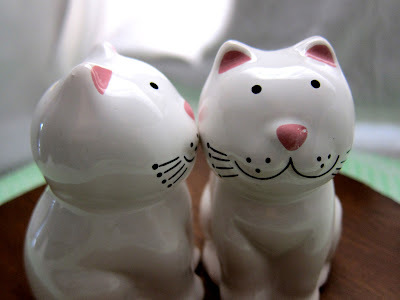 I love blogging, love your blog and love the story behind these collectibles...I have bookmarked it!! This is purry heaven. Will share. ooh, the cat with blue ball is my favorite. I keep hoping that someday I'll get a cobalt cat to add to my cobalt glass collection! Thanks so much, Stephanie! Two kitties found a new home today. Wow this reminds me of myself as a child at my dad's house. He had a shelf of all these tiny little ceramic cats (that really resembled the Tiny Goebel Cat) and I would play with them and dust them. They are still there but I haven't been to his house in awhile. I'll have to check that out the next time I go. I bet there very similar to what Amanda found! We luf it! Must check it out.